Access to Social Benefits for EU Mobile Citizens: "Tourism" or Myth? The aim of this policy paper is to shed some light on this complex debate on mobile EU citizens' access to benefits. The first section focuses on the scope of intra-European mobility, the profile of mobile EU citizens and their burden on host countries' welfare system. The second section presents an overview of the EU's legal framework with regard to mobile citizens' access to benefits by identifying the provisions concerning workers, economically inactive citizens and first-time jobseekers. The third section highlights both the responsibility of Member States in the organisation of their welfare system and the recently adopted reforms which limit EU citizens' access to benefits as well as the modifications foreseen in the EU-UK deal to the relevant European legislation. Lastly, the fourth section presents the challenges to be met and the outlook for the future. Copyright 2018 by Notre Europe - Jacques Delors Institute. All rights reserved. 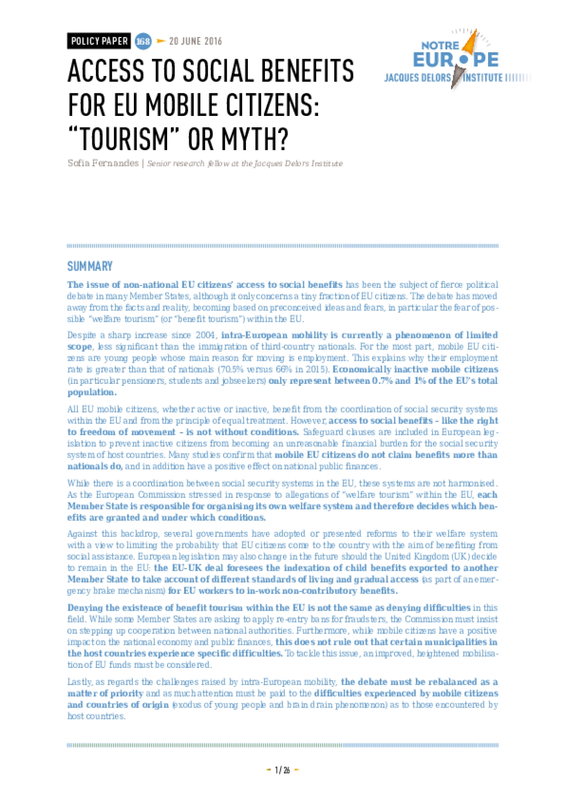 Title: Access to Social Benefits for EU Mobile Citizens: "Tourism" or Myth?